Forgive, O Lord, we beseech thee, the sins of thy people, that we who are not able to do anything of ourselves that can be pleasing to thee, may be assisted in the way of salvation by the prayers of the mother of thy Son. Through the same Christ our Lord. Amen. On this festival the church commemorates the happy departure of the Virgin Mary, and her translation into the kingdom of her Son, in which she received from him a crown of immortal glory, and a throne above all the other saints and heavenly spirits. After Christ, as the triumphant conqueror of death and hell, ascended into heaven, his blessed Mother remained at Jerusalem, persevering in prayer with the disciples, till, with them, she had received the Holy Ghost. St. John the Evangelist, to whom Christ recommended her on his cross, took her under his protection. The prelates assembled in the general council which was held at Ephesus in 431, mention as the highest prerogative of that city, that it had received a great lustre from St. John the Evangelist, and the Mother of God, saying, In which John the Theologian, and the Virgin Mother of God, the holy Mary, conversed, or rather, are honoured with churches held in special veneration. Tillemont, and some others, conjecture from this passage, that she died at Ephesus; but others think rather at Jerusalem, where, in later ages, mention is made of her sepulchre cut in a rock at Gethusemani. All agree that she lived to a very advanced age, improving daily in perfect charity, and in the most heroic exercise of all other virtues. She paid the common debt of nature, none among the children of Adam being exempt from that rigorous law. But the death of the saints is rather to be called a sweet sleep than death; much more that of the queen of saints, who had been exempt from all sin. It is a traditionary pious belief, that the body of the Blessed Virgin was raised by God soon after her death, and assumed to glory, by a singular privilege, before the general resurrection of the dead. This is mentioned by the learned Andrew of Crete, in the East in the seventh, and by St. Gregory of Tours, in the West in the sixth century. It is an opinion perfectly conformable to the sentiments of piety and respect which we owe to the glorious Mother of God. The preservation from corruption, and speedy assumption to glory, was a privilege which seems justly due to that sacred body which was never defiled by any sin, which was ever the most holy and pure temple of God, preserved from all contagion of Adam, and the common curse of mankind; to that body from which the eternal word received his own adorable flesh, by whose hands he was pleased to be nourished and clothed on earth, and whom he vouchsafed to obey and honour as his mother. So great was the respect and veneration of the fathers towards this most holy and most exalted of all pure creatures, that St. Epiphanius durst not affirm that she ever died, because he had never found any mention of her death, and because she might have been preserved immortal, and translated to glory without dying. Much more ought piety to incline us to receive with deference a tradition so ancient and so well recommended to us as is this of the corporal assumption of the Virgin Mary; an opinion which the Church so far favours as to read, from the works of St. John Damascen and St. Bernard, an account of it in the breviary as proper to edify, and excite the devotion of her children. But then, that our piety may be discreet, we must imitate the moderation and cautious reserve of our holy Mother the Church, and not put mere opinions any way upon a level with articles of faith, or matters of divine revelation. 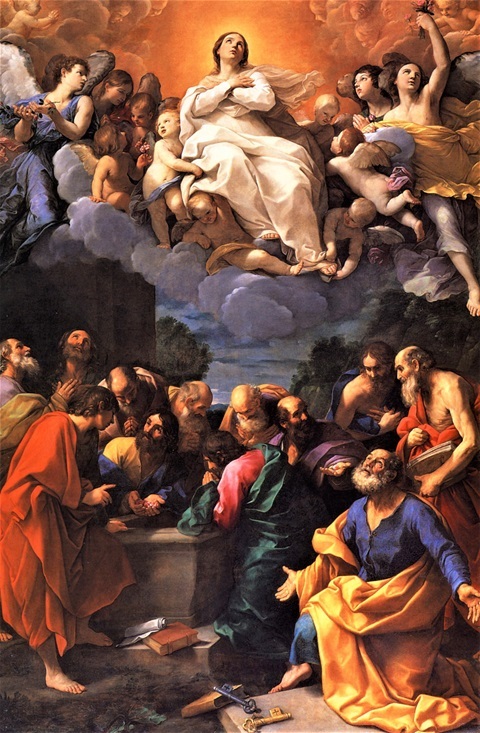 This solemnity, in ancient Martyrologies, is called the assumption, passage, or repose of the Virgin Mary. This assumption was of her both, soul and body, and is a part of the faith. For, as we honour the departure of other saints out of this world, so we have great reason to rejoice and praise God on this day, when the mother of Christ entered into the possession of those joys which he had prepared for her. We ought certainly to employ this festival in pouring forth our souls before God in most holy transports of thanksgiving for the high degree of grace and glory to which, in his infinite mercy, he has exalted her; secondly, in imitating her virtues; thirdly, in imploring his clemency and bounty through her patronage and intercession. We shall excite ourselves to these duties by considering on one side to how great a crown she is raised, and by what means she attained to it; and on the other, how powerful an advocate God hath given us in her. The Assumption of the Virgin Mary is the greatest of all the festivals which the church celebrates in her honour. It is the consummation of all the other great mysteries by which her life was rendered most wonderful; it is the birthday of her true greatness and glory, and the crowning of all the virtues of her whole life, which we admire single in her other festivals. It is for all these gifts conferred on her that we are on this day to praise and thank him who is the author of them; but especially for that glory with which he hath crowned her. In this we must join our homages and joy with all the blessed Spirits in heaven. What must have been their exultation and triumph on this occasion! With what honour do we think God himself received his mother into his kingdom! What glory did he bestow on her whom he exalted above the highest cherubims, and placed on a throne raised above all the choirs of his blessed spirits! The seraphims, angels, and all the other glorious inhabitants of his kingdom, seeing the graces with which she was adorned, and the dazzling beauty and lustre with which she shone forth as she mounted on high from the earth, cried out in amaze, “Who is she that cometh up from the desert, flowing with charms and delights, leaning upon her beloved?” (Cant, viii. 5) Accustomed as they were to the wonders of heaven, in which God displayeth the magnificence of his power and greatness, they are nevertheless astonished to behold the glory of Mary; and much more so, to see the earth, which had been loaded with maledictions, and covered with monsters of abomination and horror, now produce so great a treasure, and send to them so rich a present. They pronounce it blessed for having given her birth; but their heaven much more so in now receiving her for eternity. But ought we not rather to stop our inquiries in silent raptures of admiration and praise, than presume to pursue them in an object which is the astonishment of the highest angels? This made St. Bernard say on this subject,— “Nothing more delights me, yet nothing terrifies me more than to discourse of the glory of the Virgin Mary.” It is presumption to offer to dive into God's secret mysteries, by pretending to fathom or measure the degree of bliss to which she is raised. Let it then suffice that we know her honour now is proportioned to the incomprehensible dignity of Mother of God which she bears, and to the transcendent degree of grace and merits which she possessed on earth, and which she had never ceased to increase every moment of her life. We extol her incomparable dignity in being the mother of her Creator; a dignity which no mortal tongue can express; but we may confidently say that the glory with which Christ received her in heaven is no less above the reach of our understanding. Martha was highly favoured when she had the honour to harbour Jesus under her roof; the history of which is read in the gospel of this festival. But that was only an emblem or shadow of the happiness of the Virgin Mary, who not only received her Creator into her house, but conceived and bore him in her womb. Yet this so high a dignity only met with its recompense in the happiness to which she was admitted on this day, on which she was received by him in his glory, as she had harboured him on earth in her womb and under her roof. He who rewards so richly those who for his sake serve or relieve the least of his members on earth, though they should only give them a cup of cold water, displays his liberality with the utmost profusion of great gifts in favour of a mother the most faithful to his graces, the most fervent in his love, and the most constant in his service. He remembers the affection, piety, and fervour with which she sanctified herself before she conceived him, and during the remainder of her life; with which she bore him in her womb, cherished and served him in his mortal body upon earth, and suffered with him, by compassion, on Mount Calvary; and now he repays her by the honour with which he receives and crowns her. This he does in a manner so much the more wonderful as he is infinite in power, love, and goodness, and as his ways are infinitely exalted above those of creatures. Moreover, his own honour is here interested that he should glorify one that stands in so near a relation to himself, and that he should exalt his mother by the gifts of his glory as he enriched her with his most extraordinary graces when he first chose her to that dignity. She is said to be clothed with the sun, that is, with a glory transcending that of the other blessed, as the brightness of the sun surpasseth the stars; it is added, that the moon is placed under her feet. “Of this heavenly queen,” says St. Francis of Sales, “from my heart I proclaim this loving and true thought. The angels and saints are only compared to stars, and the first of those to the fairest of these. But she is fair as the moon; as easily to be discerned from the other saints as the sun is from the stars.” She receives a crown, not like those of other saints, but of twelve stars. (Apoc, xii. 1) If she rejoices exceedingly in her own bliss, much more will she overflow with joy in the glory of her divine Son. What a singular pleasure must she feel to behold him whom she had with so much solicitude ministered to, so affectionately attended, and so grievously mourned for, now placed on the throne of his majesty, resplendent with the glory of the divinity, and proclaimed every where the Lord of all things! What raptures of love and joy must transport her soul at this sight! And with what tenderness does he address, and say to her, “You ministered to me far above all others in my state of humiliation; and I will minister to you more abundantly than to any other in my glory. I received from you my humanity, and I will bestow on you the riches of my immortality.” The devil, beholding her exaltation, swells with rage to see his seduction of the first Eve become an occasion of so great a dignity and glory to Mary. All the holy choirs of heaven contemplating her exaltation, praise the mercies and gifts of God in her. We on earth are bound, on many accounts, to join them in the duty of thanksgiving and joy. Whilst we contemplate the glory to which Mary is raised by her triumph on this day, in profound sentiments of veneration, astonishment, and praise, we ought, for our own advantage, to consider by what means she arrived at this sublime degree of honour and happiness, that we may walk in her steps. That she should be the mother of her Creator was the most wonderful miracle, and the highest dignity; yet it was not properly this that God crowned in her, as Christ himself assures us. (St. Luke, xi. 28; St. Matth, xii. 50) So near a relation to God was to be adorned with the greatest graces; and Mary's fidelity to them was the measure of her glory. It was her virtue that God considered in the recompense he bestowed upon her; herein he regarded her charity, her profound humility, her purity, her patience, her meekness, holy zeal, and ardour in paying to God the most perfect homage of adoration, love, praise, and thanksgiving. Charity, or the love of God, is the queen and the most excellent of all virtues; it is also their form or soul; because no other virtue can be meritorious of eternal life, unless it be animated, and proceed from the motive of holy charity. In this consists the perfection of all true sanctity. Mary surpassed all others in sanctity in proportion as she excelled them in the most pure, most ardent, and most perfect charity. This virtue she exercised and improved continually in her soul, by the ardour with which she served Christ both in person and in his members—the poor; by the most constant and perfect obedience to the divine law in all things; by the most entire resignation and sacrifice of herself to God's will; the most invincible patience and meekness, and by all other virtues; especially assiduous acts of adoration, hope, praise, thanksgiving, supplication, and the like parts of prayer, in which she employed her holy soul with all her affections. But if charity was the perfection of her eminent sanctity, its ground-work was her sincere and most profound humility. This was the source of her transcendent charity, and of all her other virtues, by drawing from heaven those graces into her soul. This chiefly attracted God from the seat of his glory into her chaste womb; the same raised her to the highest throne among the blessed. Yes; the assumption of Mary in glory was only the triumph of her humility. Hereof we have the most authentic assurance. (St. Luke, i. 48) She was exalted in virtue, dignity, and glory above all other pure or mere creatures, because she was of all others the most humble. Therefore did charity and every other virtue shoot so deep roots in her heart, and raise their head like a palm-tree in Cades, and is like a cedar on Libanus; spreading their shade like a cypress-tree on Mount Sion, and diffusing their sweet odour as a rose-plant in Jericho, like cinnamon and aromatic balm, and like the best myrrh. (Ecclus, xxiv.) Therefore she ascends so high because in her own sentiments of herself she was so lowly. Meekness and patience are the sister-virtues and inseparable companions of humility. By these was Mary to purchase her great crown; and to furnish her with occasions for the most perfect exercise of these and all other virtues in the most heroic degree, God was pleased to visit her with the sharpest trials. Though she was the mother of God, never defiled with the least stain of sin, and by a singular privilege of grace, free from concupiscence, yet she was not exempted from the cross of her Son. Nay, how much nearer a relation she bore to him, and how much dearer and more precious she was in his sight, so much a larger portion of his cup did he present to her above his other saints. Though she had no sins to satisfy for, yet her virtue was to be exercised and improved by trials, and the higher degree of glory was prepared for her, by so much the more severe crosses was it to be earned. Besides these reasons for suffering, we who are criminal sinners, have immense debts to cancel, an unruly concupiscence to keep under, and a fund of inordinate self-love to fight against and subdue. Yet we would live without mortification and suffering, and are inclined to murmur at what ought to be the subject of our joy and ambition. God was pleased to conduct his mother through hard and rigorous ways in virtue, that her example might be a model and consolation to us under interior trials. They are painful to nature, but the ordinary exercise of heroic souls in pure and perfect love. Consolations, even those that are spiritual, are rather supports of our weakness than the test and school of solid virtue; the character of which is to suffer with patience and constancy. The path of prosperity, if uninterrupted, exposes souls to much illusion; in it many are filled only with self-love, whilst they flatter themselves they are walking with God, and reaping the fruits of virtue. The road of privations is the most secure, as well as most fruitful in heroic virtues. Certainly nothing can be more sublime, or better for us, seeing God had nothing greater for his mother. This consideration suffices alone to fill us with comfort and joy under all afflictions, that in them we are in good company, even with Christ himself, with his blessed mother, and his saints, who have all walked in this path before us, carrying their heavy crosses, which were the sources of their greatest blessings. Let us consider a little the life of Mary. What must she have suffered from the hardships of poverty, the alarming persecution of Herod, the banishment into Egypt, living after her return in a kind of exile for fear of Archelaus! Under these, and many like circumstances, we may easily imagine what continual crosses she had to bear together with her divine infant. What must she feel to see him in want, suffering cold and all other inconveniences! What, when she lost him in the temple, and saw him exposed to hardships and ill treatment on other occasions! He was persecuted and reviled by the Pharisees and others, his meekness despised, and his most holy doctrine contradicted. It was also a continual affliction to her tender heart, always full of zeal for the honour of God, and of charity for men, to see the whole world filled with sins, blasphemies against so good a God, scandals, abuses, and wrecks of souls. But what was her grief to see her most amiable and divine Son in his sacred passion, covered with ignominies, overwhelmed with the blackest calumnies, bound, scourged, crowned with thorns, and dying on a cross! How sharp a sword of most bitter grief must have then pierced the soul of this mother of sorrows! After her divine Son had left the earth, how earnest were her sighs to be united to him in glory! How bitter must the prolongation of her banishment amidst the sins of the world have been to her, whose burning charity surpassed that of all other saints! Only patience, meekness, submission to the will of God, entire confidence in him, and the assiduous exercise of prayer and divine love were her support, her comfort, and the rich harvest which she reaped from her sufferings. The weight and duration of these crosses, and the great virtues which she practised under them, are the measure of that height of glory to which she is exalted. We see the means by which Mary mounted to the happiness which she now enjoys. No other way is open to us. The same path which conducted her to glory, will also lead us thither; we shall be partners in her reward, if we copy her virtues. Her example is both our model and our encouragement. From her assumption we derive another great advantage—that of her patronage. Mary, crowned in heaven, is an advocate with her Son in favour of us sinners. The constant doctrine and tradition of the church, through all ages, renders us secure in the practice of invoking this holy Virgin. The Protestant century-writers of Magdeburg trace it for us as high as the second century, and charge St. Irenæus with teaching it in the same manner that the Catholic Church does at this day. This is their remark upon those words of that great and primitive doctor: “The Virgin Mary is made the advocate of Eve,” that is, for men upon whom their first mother entailed a curse. St. Irenaeus is one of the first in the list of the fathers; and this holy and wholesome devotion he learned from his masters, St. Polycarp, and other immediate disciples of the apostles; and the same has been delivered down by the pastors of the church with the whole sacred deposit of our faith, without changing one iota; for its faith is always the same, and unalterable. This is easy to prove with regard to the present point from the clear testimonies of ancient venerable fathers. But it would be superfluous and tedious to load a discourse with the quotations of all those writers who are, in every age, vouchsafers of this article of the Catholic faith, and witnesses of the homages which the church, instructed by the Holy Ghost, has never failed to pay to the glorious Mother of God. It is confirmed from the watchful attention with which the church has condemned all errors that have been broached contrary to it. St. Epiphanius informs us, that in the fourth age, among the Apollinarists sprang up, in Arabia, the heretics called Antidicomarianitæ, or adversaries of Mary, who affirmed that she had not remained a virgin, and that after the birth of Christ she had children by St. Joseph. He tells us, that there arose at the same time, and in the same country, another heresy, quite contrary to the former, the professors of which were called Collyridians, from certain cakes, called, in Greek, Collyrides, which they offered to the Virgin Mary, honouring her with sacrifices as a kind of divinity, and thus changing piety and devotion into superstition and idolatry. St. Epiphanius, discoursing against this heresy, concludes that Mary ought to be honoured, but God alone adored. This error was immediately crushed by the authority of the church; but it shows that the faithful then paid solemn devotion to this queen of heaven, which some ignorant people took occasion impiously to pervert. Likewise, when Nestorius blasphemously denied to the Virgin Mary the title and dignity of Mother of God, this heresy did but awake the piety of the faithful, and the error, as it always happens, served to establish the truth with greater lustre by the decisions of councils, and the most authentic public monuments and writings of the fathers, full of devotion and the strongest addresses to this glorious advocate of sinners, as may be seen in several works of St. Cyril of Alexandria against Nestorius, in the discourses of St. Proclus on the Virgin Mary against the same heresiarch, and others. The fathers, moreover, encourage us to place a confidence in her holy patronage, by frequent miraculous instances which they have recorded. St. Gregory of Nyssa tells us, that the Blessed Virgin, and St. John Evangelist, in a vision, delivered to St. Gregory Thaumaturgus, in the year 244, a creed which afterwards preserved the Church of Neocæsarea from the Arian heresy. St. Gregory Nazianzen relates, that the holy virgin and martyr, Justina, in the reign of Dioclesian, besought the Virgin Mary to assist her against infamous tempters, and the magical charms of Cyprian, and was wonderfully succoured, Cyprian himself being converted, and becoming a glorious martyr. St. Sophronius and John Moschus, in the Spiritual Meadow, mention a certain merchant of Alexandria, who, on setting out on a voyage to Constantinople, recommended his wife and little daughter to “our Lady the holy Mother of God;” and by her patronage they were both miraculously preserved, during his absence, from being robbed and murdered. Many other such instances might be gathered from the writings of the most holy and illustrious fathers of the church, than which nothing can more clearly prove what were their sentiments and practice, and those of the whole church from the earliest times, with regard to this devotion to the Mother of God. We are encouraged to be fervent in this great means of mercy by the experience of her powerful intercession, confirmed by illustrious examples. “Let him cease to extol thy clemency, O holy Virgin,” cries out her devout client, St. Bernard, “who ever invoked thy aid in his necessities, and found it to fail him.” Hence, not only the Cistercian, but many other religious Orders, and numberless pious confraternities, have solemnly put themselves under the special patronage of the Mother of God; and many kingdoms have done the same, as Hungary, by the devotion of St. Stephen, and France, by the vow of Lewis XIII in 1638, in memory of which an annual most solemn procession is performed in all parts of that kingdom on this festival of the Assumption. The church strongly recommends to us this wholesome devotion by establishing so many feasts in honour of this holy virgin. This of her Assumption was celebrated with the utmost solemnity at Jerusalem in the fifth and sixth ages, as appears from the life of St. Theodosius. St. Proclus, on this day of her festival, in 428, delivered his famous sermon against Nestorius, in his presence, proving the Virgin Mary to be the Mother of God. We find churches dedicated to God in her honour in all parts of the Christian world, as soon as that liberty was allowed under the first Christian emperors. The great Church of Ephesus bore her name when the general council was assembled in it against Nestorius, in 431. St. Mary Major was built in Rome in the time of Pope Liberius, and consecrated by Sixtus III about the year 433, as is proved by the Bollandists. Theodorus Lector mentions that the Empress Pulcheria built two churches in her honour at Constantinople. About the same time, one was built at Jerusalem by St. Sabas, &c.
The voice of the church, the example of so many eminent saints, and the most powerful motives of religion, recommend to us a singular devotion to the glorious Mother of God. St. Teresa, in her childhood, grieving for the loss of her mother, cast herself on her knees before a picture of the Blessed Virgin, beseeching her, with many tears, to take her under her special patronage, and to be to her a tender mother and tutoress. In like manner, we may, by a solemn dedication of ourselves to God, under the patronage of the Virgin Mary, choose her for our principal advocate with him, and commend ourselves most earnestly to her mediation. This recommendation of ourselves to her we may renew in our morning and night devotions, and in a more solemn manner on all her festivals; imploring, moreover, her intercession in all temptations and necessities, spiritual or corporal. Base and unworthy sinners as we are, can we do better than strengthen our prayers by the joint intercession of such an advocate, and by invoking her as our secure refuge? St. Bernard puts into our mouths the following address to her :—“O blessed finder of grace, mother of life, mother of salvation, may we, through you, have access to your Son, and that he who was given us through you, may receive us through you. May your integrity and innocence excuse before him the stain of our corruption; may your humility, so agreeable to God, obtain the pardon of our vanity; may your abundant charity cover the multitude of our sins, and your glorious fruitfulness supply our indigence of merits. Our lady, our mediatrix, our advocate, reconcile us to your Son, commend us to your Son, present us to your Son. By the grace with which you are honoured, by the mercy which you have brought forth, obtain that he, who through you put on our weakness, may through you make us partakers of his bliss and glory.” But to obtain the protection of the Mother of God, we must not content ourselves to implore it barely in words, but must do this also with our hearts, and with a sincere desire of serving God with fervour. To be devout to the Mother we must copy her virtues, and live faithful to the holy law of her Son. She is the refuge of sinners; but of such as sue for pardon with sincere repentance; not of those who wilfully continue to crucify her Son. She detests the false confidence of such, and can never countenance their presumption and impiety. An imitation of her virtues and spirit is the most solid proof of a true devotion to her, and the means to honour her, and to recommend our petitions through her to her divine Son.